We need food in order to survive. Reason being - that is the source of energy that we need to move and keep us warm. All critters (organisms) get their food from their surrounding environment. This is what makes up an ecosystem. An ecosystem is an area of nature in which living things (Biotic) and non-living things (Abiotic) interact to exchange energy and materials. Without Energy and Abiotic factors, life would not survive. There are many different types of biomes and ecosystems - but the basic set up is the same. First, you have your producers - or plants which produce the food. This is why you go to the "Produce" section of the grocery store to get your fruits and vegetables - after all, fruits and vegetables are the original source of food produced. Plants get their energy from the sun. Second, you have your primary consumers - or animals that eat the food that was produced (Herbivores). These guys get their energy from the plants that got it from the sun. Third, you have your secondary consumers - or animals that eat the animals that ate the food that was produced (Carnivores). These guys get their energy from the critters that got the energy from the plants that got it from the sun. Got it? If you're confused - look at the diagram below. Basic idea you need to know. Though plants make their own food, they still use some of that energy from the food they produced to grow and do other biological functions. Only 10% of the energy they got from the sun is left over that the primary consumer/herbivore can use. 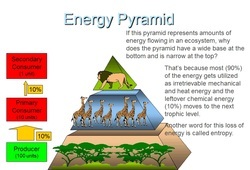 When the herbivore consumes the chemical energy from the plant (sugar & oxygen) - 90% of it gets converted into mechanical and heat energy - the remaining 10% of the energy left over is used to replenish tissues etc. in the form of proteins and fats. So when a secondary consumer comes along to eat the herbivore - it doesn't get a lot of energy that was left over by the plant. In other words, it will take quite a bit of plant material to make a good portion of meat and fat that will satisfy the energy needs of the carnivore. Using the diagram above, we can look at it this way. 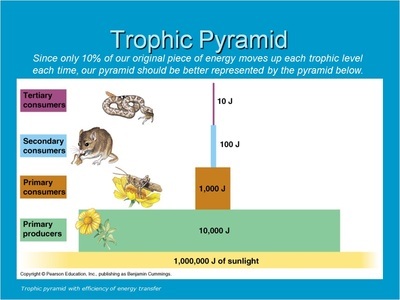 If 1000 Joules of sunlight is utilized by the plant, 900 Joules (90%) is used by the plant for growth and other bio-processes. 100 Joules of energy (10%) is left over in the forms of sugar and oxygen (chemical energy). 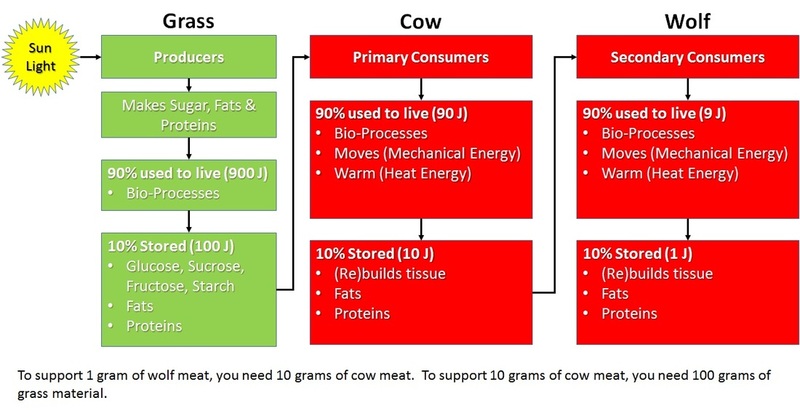 When the sugar / oxygen is consumed by the deer (primary consumer/herbivore), of the 100 Joules of energy that it got from the plant, 90 Joules (90%) is utilized for the animals ability to move (mechanical) and keep its self warm (heat). The other remaining 10 Joules (10%) is used to (re)-grow muscle fibers, fat, and other body tissues. These are made out of proteins and fat (chemical energy). 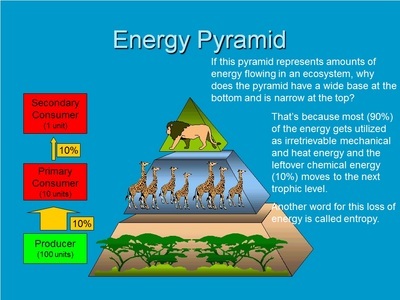 When the deer (herbivore) is consumed by the cougar (secondary consumer) - of the remaining energy left over, 10 Joules of energy, 9 Joules of energy go into allowing the cougar (secondary consumer) to move (mechanical) and keep warm (heat), and 1 joule of energy is used for building proteins and fats for (re)-building body tissues. This is why it takes a lot of plant material to make enough meat to be consumed by 1 mountain lion. On this diagram - you will notice that it's wide at the bottom, and narrow at the top. 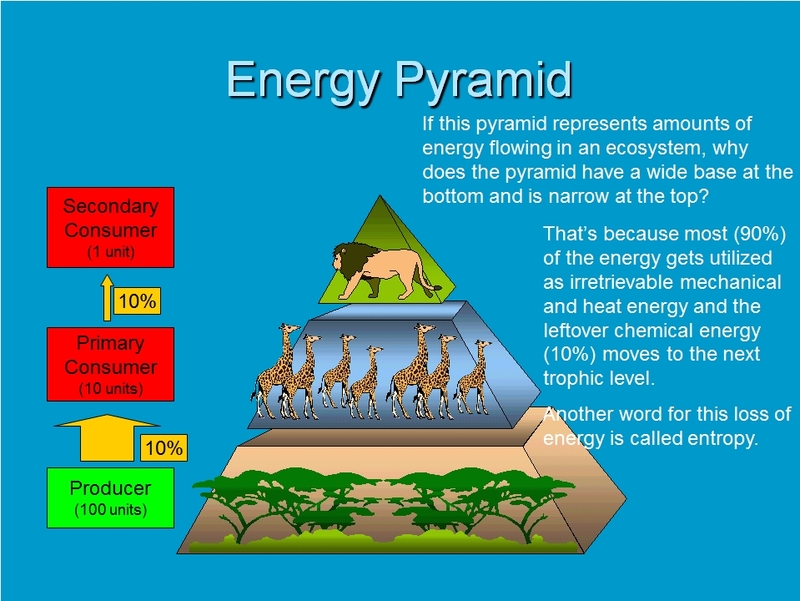 This is because energy get's used by each trophic level before it moves up to the next trophic level. 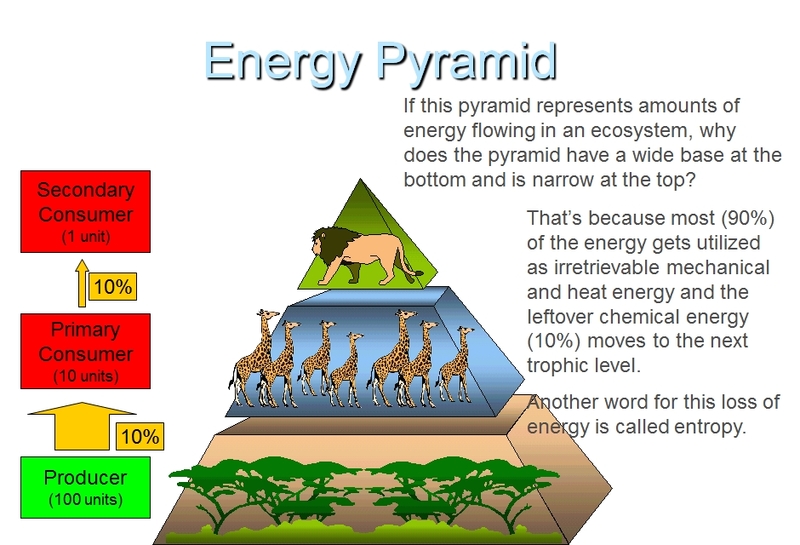 By the time the energy level reaches the top, there's really not a lot of energy to go around. This is why there are more plants than herbivores and more herbivores than carnivores. Above was a food chain - or a simple way of how energy flows through an ecosystem. 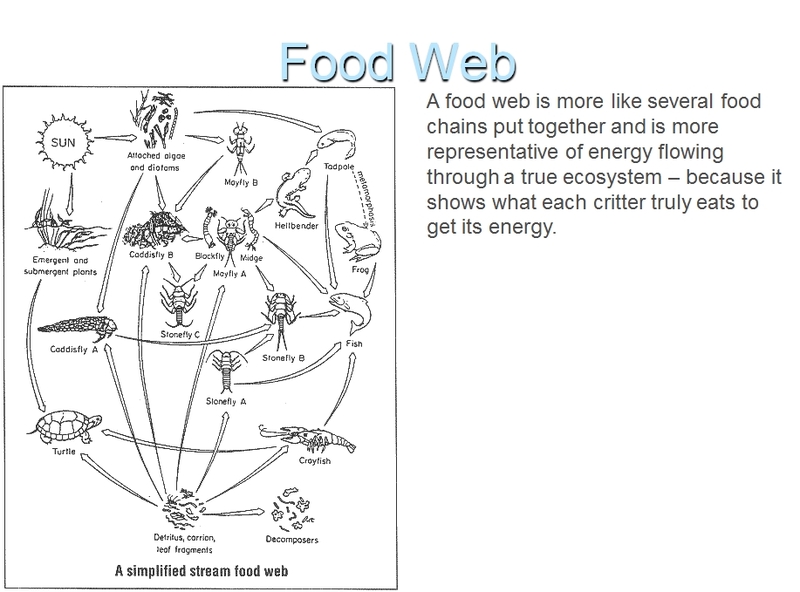 Below is an example of a food web - which is a more complicated and holistic view of how energy flows through an ecosystem. 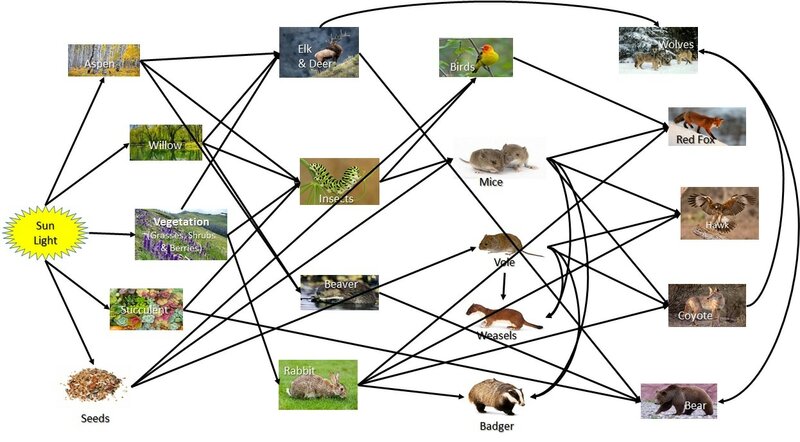 A food web is simply a complicated food chain that represents a more specific ecosystem/environment. With this assignment - take each organism mentioned in the story and place them in the correct trophic category. 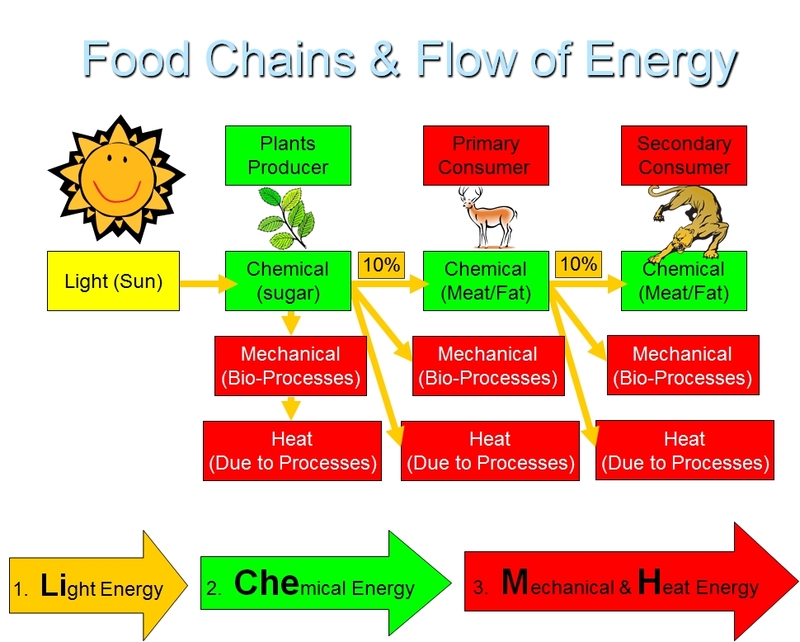 Then connect the two organisms with an arrow depicting the flow of energy. Aspen trees are biodiversity hot spots in the west. (Remember high biodiversity is good) They are home to a variety of songbirds (which eats seeds and insects). In 1997 Aspen trees were on the decline in Yellowstone and no one knew why. William J. Ripple, a scientist, went to Yellowstone to try to solve the mystery. The wolf-effect theory holds that wolves kept elk numbers at a level that prevented them from gobbling up every tree or willow that poked its head above ground. When the wolves were exterminated in the park as a menace, elk numbers soared, and the hordes consumed the vegetation (put it down in the food web under vegetation), which drove out many other species of plants and animals. For instance, without young trees on the range, beavers, for example, had little or no food, and indeed they had been absent since at least the 1950’s. Without beaver dams and the ponds they create, fewer succulents (water rich plants) could survive, and these plants are critical food for grizzly bears when they emerge from hibernation. (They need a lot of these plants to replenish themselves after hibernation). In 1995 the wolves were re-introduced, if the wolf-effect hypothesis is correct, and wolves are greatly reducing elk numbers since then, the vegetation should be coming back for the first time in seven decades. They have indeed found trees and willows rebounding in Yellowstone as wolf numbers have climbed- but that is only part of the change occurring in the park. Other changes accompany the re-growth of vegetation. In the river there is a small beaver dam-one of the first documented in 50 years. Because of the re-growth beavers have something to eat again. Also as more vegetation grows along the river, it will stabilize the banks and stop some erosion. The wolf seems to have an effect on the Yellowstone food web as well. One of its most dramatic effects has been on the coyotes. Coyotes have sacrificed a great deal to make room for the much larger wolves. The number of coyotes in the park is down 50%. With fewer coyotes, their prey- such as the voles (which eat mostly vegetation and seeds), mice, (which also eat vegetation, seeds and insects), and other rodents-have exploded in number. This has greatly benefited the red fox, which also prey upon songbirds as well. The concern, however, is that with more foxes in the ecosystem could mean a possible reduction of birds in the future. But, are the wolves really the engine driving these changes? Most scientists think so. One scientist stated that wolves are the primary force shaping the ecosystem in Yellowstone. Other researchers, however, are not convinced about the effects of the wolf. One researcher stated a strong correlation between the return of the wolves and the new growth is far from demonstrated. The ecosystem in Yellowstone is an interactive system, and there is never a single cause; for instance, as the wolves are coming back the climate is warmer. It will take 20 years or more before we know for sure. So the mystery remains unsolved for now. What do you think? Yellowstone - Video on how wolves changed the rivers.